"Craig Cuhna, 17, and Amanda Cubel, 16, both of Elkton, share a moment waterside at Rocks State Park in Harford County Sunday afternoon. The two visited the park last summer with friends and family and decided to make the trip again this year." Last Sunday I was on call and the only photographer on the clock. Thus meaning I would most likely shoot one or two assignments and wait around in case anything like an explosion or something happened. All morning and afternoon things were very slow; nothing much happening. It sort of was like watching a Nascar race. Everyone loves the race itself, but deep down inside they are bored and waiting for the 23 car pile up in turn three. Fire, smoke and dismantled tires. The works. I on the other hand was sitting at home bored, waiting for a phone call. Since cover had already been determined, my likely hood of remaining assignments was significantly narrowed. I also knew that I had shot an assignment running for Monday too, so that was taking at least one main section of the paper. Although I would never wish harm on anyone, the long afternoon of watching TiVo’d episodes of Anthony Bourdain: No Reservations was becoming lackluster. Gear ready, I was hoping for some sort of photographic action to spark my day. Then the phone rang. My heart stopped. I almost felt guilty before picking up the phone because in my head all morning and afternoon I had wanted at least one assignment. Thankfully it wasn't an explosion, a car accident or police stakeout. They were looking for a feature to fill a void, but needed it turned around quickly. One-hour. Living in Harford County, where I've never actually went feature hunting on purpose, I tried to quickly come up with places indigenous to the area that would showcase someone having a good time. Since the weather was seasonably high, I knew people would be outside. My very first idea was to go to the local swim club where pools in Maryland had opened for the first time for summer, as they always do over Memorial Day weekend. Then I pondered something Memorial Day themed. Finding an event within a 15 minute radius would probably waste time instead of using effectively searching by foot or car. So I hopped into my car and drove to the one place I knew people would be out: Rocks State Park. Whether they were grilling out, viewing the King and Queen Seat or fishing in the water, I was sure to find people having a good time. On my way there, I was thinking of a nice image of someone at the lookout point, but I had taken that picture many times, and long before my start in newspapers. I negated that preconceived image. When I got there, I saw many people by the water. Perfect. It combines my first idea of swimming children and this green wonder-world of nature. I quickly began shooting as a couple dangled their feet in the brisk-cold water and another group viewed the one rapid of the roadside river. Conversely, as I always do when feature hunting, the first few images I make are not so much insurance as a warm up. I know they aren't the strongest and always know I'll find something better. As I continued downstream, I stumbled across a group of eight people from Elkton. I watched them from a far at first, shooting some random frames. I then approached them and overheard a couple guys of the group say they were going swimming. Awesome. They made their way toward the calm waters and after dipping their feet in the water, opted not to swim anymore. Then it caught my eye. Two of the group members had hiked way ahead of the pack and were surfacing onto an island rock. I started shooting, as the green reflection of leafy trees on the water grabbed my eye. The submerged rock was also a nice visual as I began metering off the water for my exposure. Since the water was knee to waist deep, they pulled themselves up onto the rock, and I got a couple nice frames. Then for a split second, I saw the girl put her hand around the guy’s hip. I refocused and composed and she hugged him. OK, that was cute I thought. Then right as I went to chimp (look at the back of the camera at my image made) she moved her hand to his arm and then lunged in for a kiss. I reacted and got three frames off, luckily catching the lip-to-lip peak action of the kiss. I knew this worked, so I made my way down stream, from rock to rock, to record their names. At this point I had a 10 more minutes to shoot, before I would have to transmit. 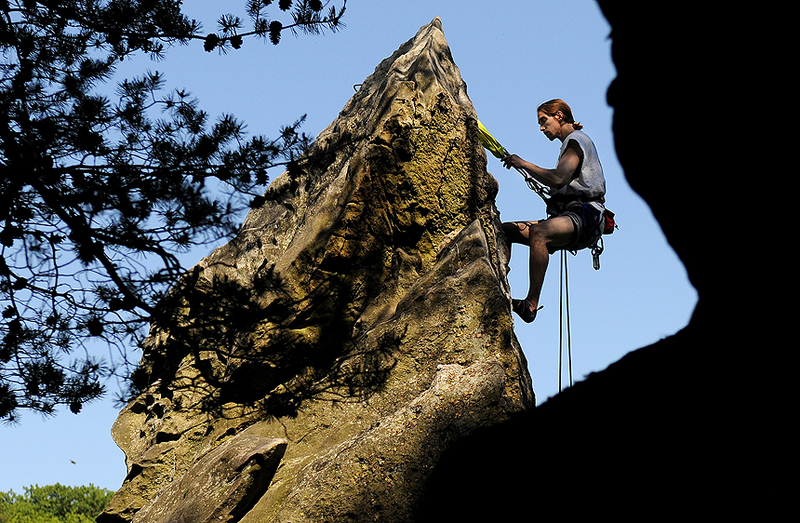 So I made one more image of a rock climber near the top. Not as strong, so I called it day. I moved both images and was glad we ran the nice moment of the water. 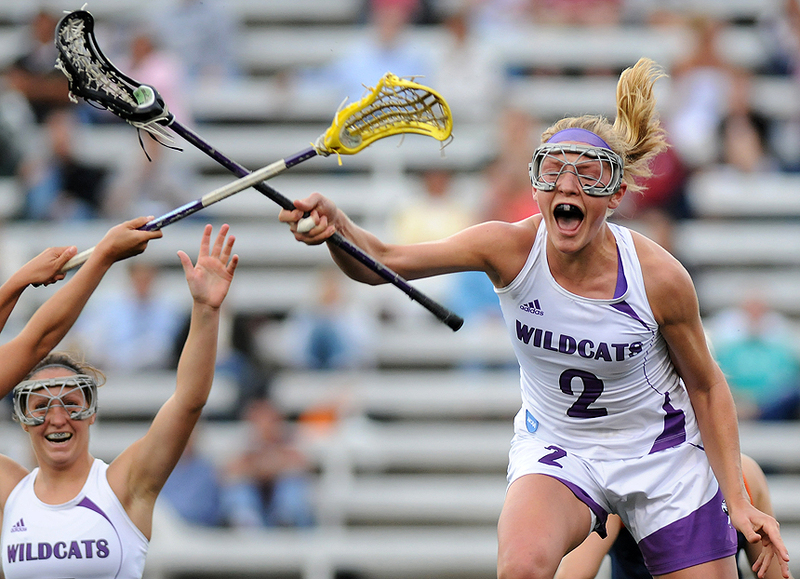 "Northwestern midfielder Danielle Spencer celebrates her second goal against Syracuse during the second half of the semifinal game of the NCAA Women's Lacrosse Championship at Johnny Unitas Stadium, Friday, May 23,2008. 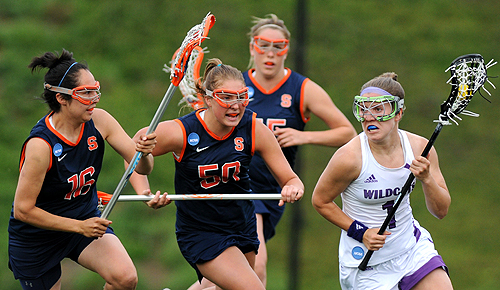 Northwestern won, 16-8, advancing them national championship match." That's all folks. No more NCAA lacrosse this season. Northwestern wrapped up the season with another championship, their fourth-straight on Sunday. Johns Hopkins, while pulling a huge upset over the high-powered Duke Blue Devils on Saturday, came up short in national title game against Syracuse on Memorial Day. I didn't know if I'd be shooting lacrosse after the Towson men's team concluded their season a little over a month ago, but I got a chance to bounce back into it, and bounce back from a tough assignment. A lot of assignments I write about are normally the better of two or three that day over a couple days work. With what I call fun or interesting assignment comes those that still need to be shot for the non-dominant pages. I believe these smaller assignments are normally the hardest to shoot. Last Friday, I had an afternoon assignment that left me feeling down after I leaving the store, but a latter assignment would put me back on a good beat. My first assignment was to cover a local, small chained television store. My goal was to get images of customers shopping for televisions. The story revolved around retailers having increased efforts to cater to consumers, especially during times when economic stimulus checks worth as much as $600 are showing up in bank accounts and mailboxes. I am still waiting for mine. With some direction, I was promoted to head to The Big Screen Store in Towson around noon. Now, I've never personally been in one of these stores, as I do most of my electronic shopping on the Internet. And if it's a big purchase, such as a TV, I'd probably scope one out at Best Buy or some store along those lines. Now that doesn't go to say other retailers aren't as successful, but there weren't many customers in the store I had to shoot in at that designated time. I spent an hour shooting waiting for customers to pour into the store. Luckily, I had the company of some fine leather reclining chairs, ESPN and two talkative, laid back salesmen to help pass the time between customers. Over the hour, four customers came into the store shopping for a new big screen. The first gentlemen is where I got all my images from and he was there for maybe 15 minutes. To be safe, I stayed after to get some other angles and a variation of shoppers. However, this was a double edged sword as the next couple folk that came in where either there for 25 seconds or didn't want to give their name. At one point, no lie, I had a guy tell me he was a convict and couldn't and wouldn't give his name, while the other guy across the store was an undercover Baltimore County policemen and refused to give his name. Ah, the irony. Only if I could have introduced the two. After I left the assignment, I wasn't very thrilled with my take. They worked, but I thought it was below my own standards. My later assignment would bounce me back into a good mood though. A couple hours later, I found myself stationed on the sideline of NCAA Women's Lacrosse Championship semifinal game between Northwestern and Syracuse. I made some great images and was excited to see such great jubilation from the Northwestern squad. One of my favorite telling moments was "as good as your gonna get," Gene Sweeney Jr., of The Baltimore Sun, said. Gene, along with anyone else shooting from the Wildcats' attacking end, also captured the image. It's the nature of the beast when there are a bunch of photographers covering an event. Now, Gene's image was a little better then mine... if I have to be honest about it. Mine caught her a fraction of second too early as her goggles covered her eyes, which also looked like they may be closed. Mine was also a little too tight. Although I like the hands coming into the frame and the teammate in background. And, hey, I stilled moved it. Conversely, why I liked it better than then my end of the game celebration, I am sort of glad we ran the latter celebration image from the game, as The Sun ran Gene's described photo. He would have showed me up. Anyways, it's these fun sports assignments or assignments that have a little more action that make being a photographer worth it after a tough assignment. "Up and coming local band, Vespertine Movement, from left, John Kennelly, Owen McCusker, Zach Wilson and Mike “Guzzi” Guzman, of Catonsville, Md., have booked shows at the Recher, Sonar and The 8x10." The other day, friend and lighting feen, David Hobby had a post about Platon shooting Vladimir Putin for Time's Man of the Year cover. During the interview, Platon described his journey on how he made the image and how for nearly a week, he had no idea whether or not he'd be able to shoot a portrait of Putin sitting and looking into the camera. He paced in his hotel room for days; waiting for a call. Evenutally, he was driven hours to Putin's home and then had to wait even longer once there. All that time wasted and he still wasn't sure if he'd get the image he wanted to make. Then luck swung his way. At the end of the interview with Time, Putin agreed to sit for a portrait. Now, I recommend watching the interview yourself, because my words don't do this story any justice. But what struck me was how he connected to his subject before shooting the images. My favorite part wasn't the image itself, his approach or the story of how he got to the portrait session, but the line where Platon said, "Get rid of the power, so we can be humans together." It has never been said so clear, yet so to the point. This is such a struggle, we as photographers, go through sometimes and it is that moment of making the subject feel comfortable and breaking the barrier that is so vital in making a telling portrait. While I didn't have that manta in mind last week during a band portrait, I did seek to get them to show who they really were. To my advantage, shooting a group of college aged band members isn't quite as challenging as a high-powered CEO or executive from a large corporation, mind you, with only a couple minutes to do so. This assignment was pushed back two days later, as rain canceled the first session. However, rain lingered in the area before this shoot, too. This time though I was trying to meet my deadline by the end of the day and shot it during a light rain. When they arrived, I knew that they would be an easy group to work with, as they were just as laid back as I was. It was almost as if I was hanging out shooting pictures of my own friends. This is always nice. Not only are the subjects relaxed, but this takes the pressure and anxiety off of me also. I told them my ideas I had in mind, and was also open to their suggestions, as they were the ones who chose Federal Hill. They agreed to let me do the driving. I did some test frames, but was looking to add a bit of depth to the picture, so I stepped back and started incorporating the park benches into the frame. As they stood there talking, I told them to keep their mark. I kept telling them I was testing my lighting as they goofed around. What they didn't know, as I spit a couple wise-humored jokes they could relate to, I was capturing their personalities. Before we moved to the famous canon on the hill, I knew I had a couple nice images of them laughing, just being themselves. 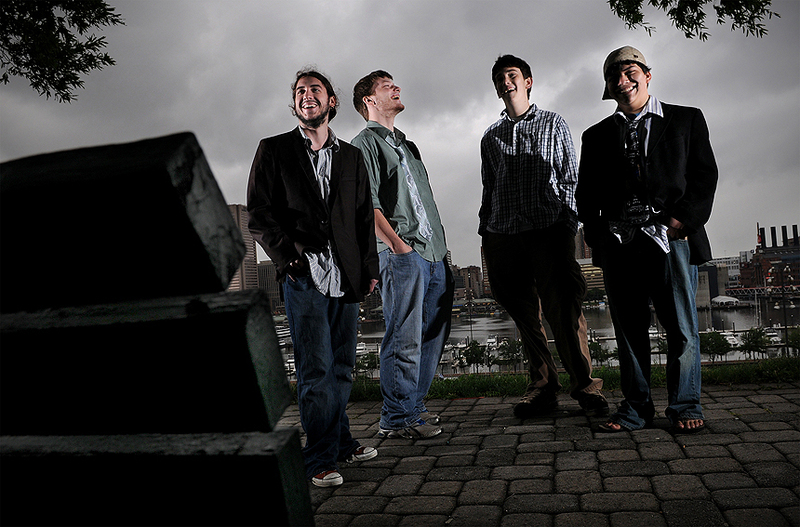 The lighting was harsh intentionally to really make the band pop from the nice cloudy conditions. If I could have changed anything, it would have been the position of the far left subject to avoid the big shadow on the guy second from the right. I did also have a couple frames where there were no harsh shadows on the two right band members faces, but I liked the above better. Minor things such as these don't tend to bother me when I know I captured the subject (or subjects) as themselves. 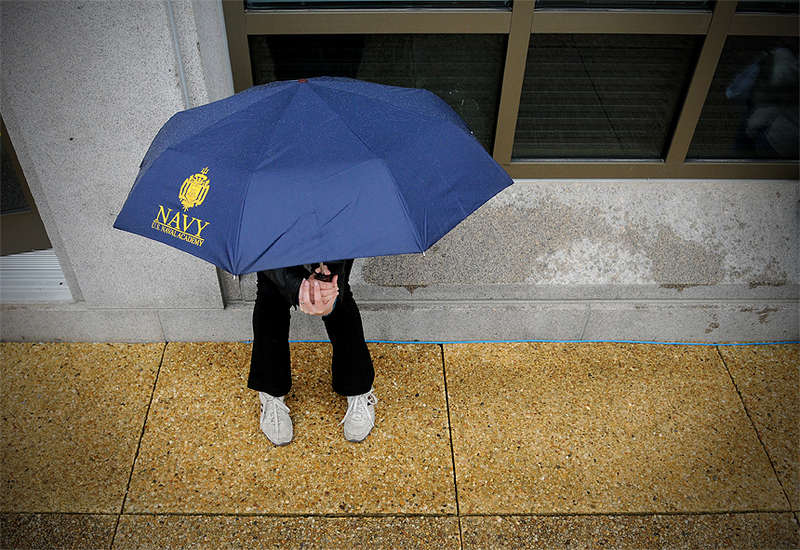 "Erin Hallford of Texas stays dry from the light rain before the Blue Angels performance at U.S. Naval Academy, Tuesday afternoon. Due to inclement weather, the Blue Angels' annual flyover in Annapolis, which is part of the Naval Academy graduation celebration, was postponed until Wednesday." This week, the weather in Maryland has been wet. I am not sure what's going on, but when it’s supposed to be clear it rains and vice versa. This didn't change for one of my assignments in Annapolis this past week. Annapolis is a great town and there isn't anything better than strolling downtown Annapolis near the U.S. Naval Academy on a summer evening. About 45 minutes to an hour, depending on traffic south from my house, I often find myself shooting down that way. I don't mind as it gets me out of the realm of Towson and Baltimore. Not to mention, there is always a nice feature to be found in town. Each time I've been, whether for: baseball, basketball, football, lacrosse or other ceremonies, it's always confusing to some degree. Since the security on the base is very strict in comparison to say a typical college campus, getting credentialed before hand is a must. This is something the publication takes care of beforehand. However, most of time, parking on the actual base is forbidden. Thus meaning parking at the football stadium and getting shuttled on or paying to park down by the water and walking. I had parking on the base and it seemed like smooth sailing (no pun intended). However, something always seems to go to ship (no pun intended) when everything else is going easy. When I left my house around noon it was cloudy, yet clear and dry. Knowing it could possibly be wet, inclement weather, I was told if it's completely cloudy and nasty that we'd skip the assignment. After driving through the Harbor Tunnel Thruway, I gave the public relations folk a ring down at the U.S. Naval Academy to see if they had word on whether or not the Angels would be flying. I didn't hear anything back, so I assumed it was still on. As I continued toward the base this is how the weather changed in a 25 minute span: Clear. Mist. Clear. Rain. Clear. Cloudy. Slight Rain. Mist. Cloudy. No joke. I wasn't sure what was going on, but it was odd. Upon arrival, I got a call from the PR people and they informed me that it was still a fifty-fifty chance they would fly. From there I was escorted to my parking spot and then to another public relations person on the field where police and those making the final call on the fly over were standing. As I stood there asking short of a million questions to a couple friendly flyers and Naval officers, I prayed the assignment will still take place, as I've never even seen the Blue Angels on television, nonetheless in person. A reporter from the Capital Gazette, whom had witnessed the flyovers more than he could remember, told me that during the initial fly over that I would be more shocked and shaken up by the sheer sound that I may no even get a picture. He insured me I'd get a great shot, but not during the first pass. I am not going to lie; my adrenaline pumped through my veins. I was ready. Fast forward to more than an hour later. Still no word on if they would fly. At this point, I knew I needed to still tell the story, so I began to shoot features of people that braved the light rain and had gathered around the field with umbrellas in hand and dressed in ponchos. Then the unofficial word came. The practice and air show would be postponed until Wednesday. Drat. A morning practice followed by an afternoon air show would happen Wednesday. I knew this was legitimate when traffic began moving on the Route 450 Bridge, which they shut down before and during the air show, and the masses began to leave in herds. Sometimes things are out of your control and you have to make the most of situation. Come to find out, two days later, two of the six jets performed later in the day Tuesday. Too bad I had a 4 p.m. back in Baltimore and couldn't wait around for it. I would have loved to witness and document the high speed, high flying, high precision daredevil act. 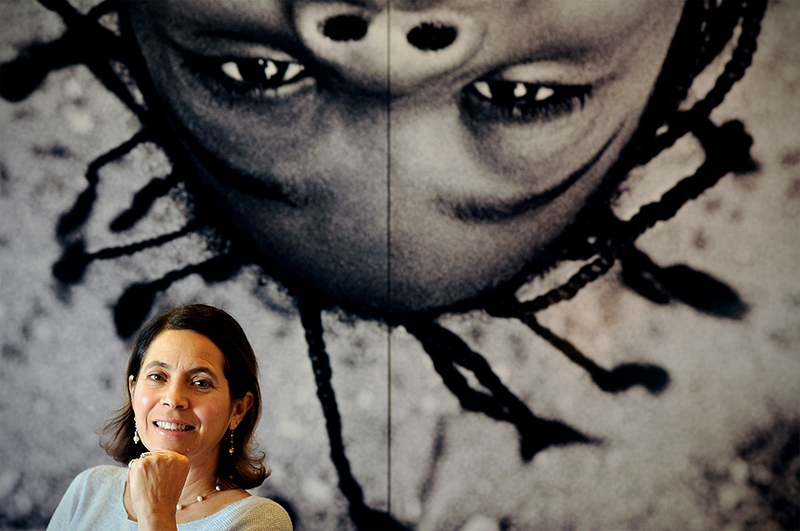 "Diana Morris, Director of Open Society Institute, and the rest of OSI-Baltimore mark their 10-year anniversary in 2008. 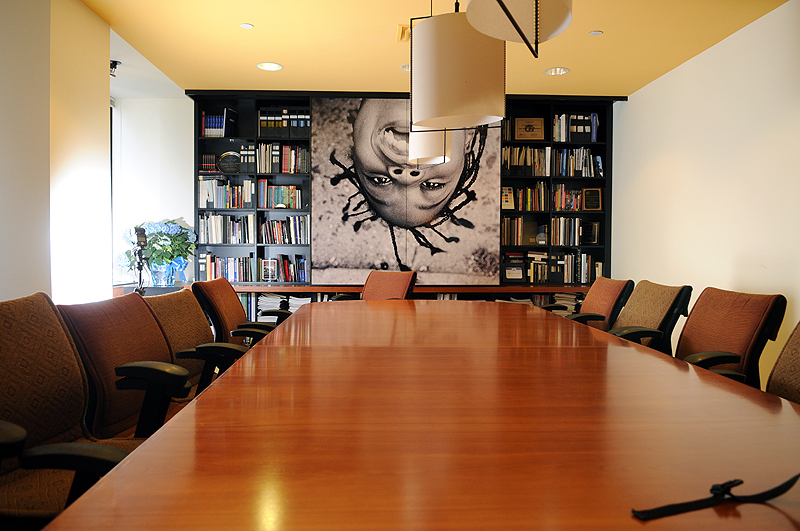 Over the past 10 years, the multifaceted nonprofit has tackled subjects such as inadequate drug addiction treatment, poorly performing schools and unacceptably high rates of incarceration." Last week there was nothing more I wanted than a good dinner out on the town. I got that meal, it was delicious, but during the early morning, warning signs told me my meal was not very good after all. In the wee-hours of the morning I was awaken by a grumbling stomach and a rash fever. Roughly 20 seconds later I was in the bathroom saying hello to my dinner. Food poisoning was the verdict, so I expect. It was a long night. I'll leave it at that. Since classes were over at that point, I had originally planned to wake up early, check my e-mail for assignments and either go shoot or go back to bed. However, having been up all morning ill, I never quite made it up at 7 a.m. like I had planned. Around 9 a.m., I got a text saying, "If you're up, check your e-mail." I grabbed my phone, checked my e-mail and saw I had a 10:30 a.m. downtown. Still feeling slightly ill, I gave my editor a call and said I still could get to the assignment and I was leaving my house in 30 minutes. I downed some water, hopped in and out of the shower, got dressed, grabbed my gear bag, and was out the door. At 10:15 a.m. I was in downtown Baltimore and had easily found a parking spot, which was surprising. I was still rushing though. I was still feeling tempered, too. With a smile on, I took the elevator up to the 13th floor where my subject was not waiting for me. The assignment had said 10:30 a.m., but she was running about 10 minutes late her assistant told me. "Feel free to scope out a place to shoot and setup," he said. This was actually an advantage, because I wasn't feeling too well at this point, and while I do like meeting new people and making small talk, I was actually happy that I wasn't going to get much face time with her. No offense to her, but I was just feeling sick. I searched around and found a cool board meeting room. Since the assistant told me they do a good amount of work helping children, I knew the moral would be a good, eye-catching graphic as a background. But I had forgotten something. My umbrella. Typically I use an umbrella to get a nice soft, large light source when shooting corporate type people. But rushing and not thinking clearly, I had forgotten it in my trunk. I didn't want to risk leaving, so I used a something from my bag-o-tricks. I fired my Nikon SB-800 (read:flash) against a white wall to soften the light. I killed all the tungsten lighting and let only the ambient daylight spill into the room. I shot my first test frame at 10:26 a.m. and then waited around for her. Normally, I get business people out of their office, out from behind their desk and take them outside. But since my time was becoming limited by the minute, I had to stick to their office space. My first frame of her was at 10:53 a.m. I was really pushing my shooting window, as the assignment said this was the only time she could sit for a portrait and her phone interview was at 11 a.m. Some feel uncomfortable when they are only allotted a small amount of time to shoot, or feel demanding when they tell people what to do during a portrait. I actually don't mind being bossy if I have to, and small amount of time to shoot is always a good challenge. Luckily, she did exactly what I asked her with no hesitations. A couple tweaks to my original camera and flash settings, and about three minutes later, I had my three variations of her by 10:56 a.m. This left me enough time to check the back of my camera to make sure the images would work for the story. It also allowed her enough time to get back to her desk and take the phone call interview from the reporter. In addition, it also allowed me to get back to my car, move the images and go back home to get some rest. 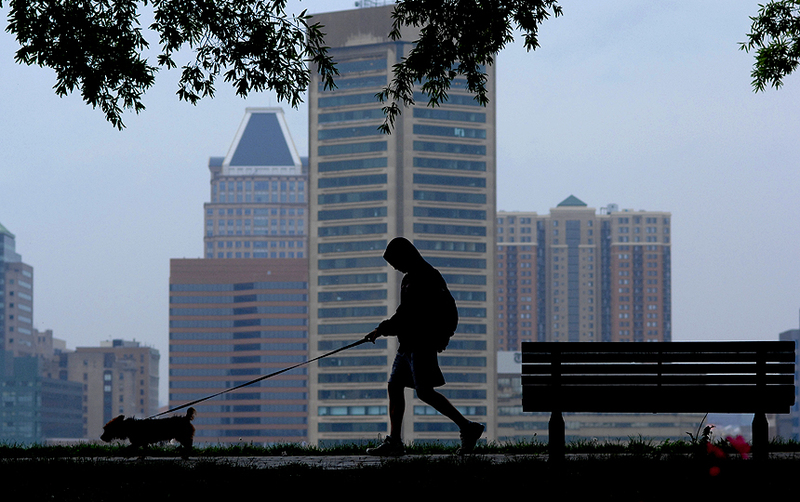 "Hood up and head down, a passerby contests the rain with his dog at Federal Hill Park, which overlooks downtown Baltimore City, Sunday afternoon. Thunderstorms entered downtown Baltimore late Saturday night and are expected to clear out by Monday." I had planned to occupy this post with some horses, wild shenanigans and big hats. Well, as you may have guessed no Preakness for me this year. Missed a great opportunity to do some assisting, but missed the call while in class. Life goes on. In replacement, I never used to like the rain, but I love it now. There is so much going on that people never see because we've been trained to be miserable and stay indoors when it rains. Now that I've somewhat overcome the dreadful habit of staying indoors, I've been venturing out on foot when it does rain. I don't look forward to rain, because that would be ridiculous, but a slight drizzle doesn't seem to bother me anymore. On Sunday, my second assignment was scheduled for 2:30 p.m. on top of Federal Hill. For those that have never been to Baltimore, Federal Hill Park is a small area that overlooks the inner harbor and downtown area. After my first assignment, I drove across the harbor. Yep. My car is also a boat. I should have said, I drove around the harbor. On any other day, I would have walked. Ah, you got me. "I thought you said you didn't mind the wet weather?" Well, I don't. But I am not about to get all my gear drenched as I walked alongside tourists and boats, and then up Federal Hill. Being early, since I was already downtown, I decided to grab some lunch and work on my first assignment in Cross Street Market. Must have lost track of the days, because when I tried to open the door it was locked. I had totally forgotten it was Sunday. NOT Saturday. Bummer. Instead, I opted for Subway. Not as delicious as any number of things from the market. Around 2:15 p.m., pouring rain at this point, I called one of my subjects who was getting a portrait with some others on Federal Hill. I let them know that the deadline for this particular assignment was on Wednesday afternoon and asked if they'd like to meet somewhere else, shoot in the rain or reschedule. Typically I wouldn't call a subject (unless confirming), but since the deadline was not urgent and the soggy conditions lingered, I figured I'd see what their input on the weather was. I didn't mind the rain, was totally fine shooting in it, but they may hate it. The main subject agreed that the weather would make things complicated and not very pleasant. So since there were four people being shot together, he needed to call me back. While I wasn't wasting my phone minutes, I shot a couple passerbies in the park along the cityscape. As I tried to keep my camera dry with my Subway bag, I was hoping for someone with an umbrella to silhouette them on the city backdrop. All I got was a man walking his dog with his hood up. I wasn't able to chase him down to talk to him either. This goes to show people do go out when it rains. Conversely, he was one of three people that walked by when I was waiting for the return call. Three minutes later my phone rang, it was my subject. Since it was a total downpour, they thought it would make more sense to meet Tuesday morning. Works for me, hopefully, for their sake, and my deadline's sake too, it won't be dumping the cold water pellets. 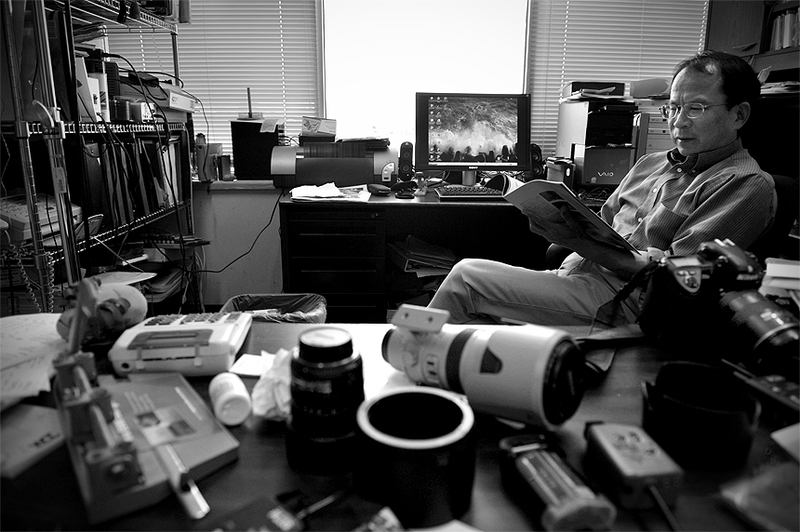 "Among piles of camera equipment, Kanji shuffles through a magazine in his office at Towson University before heading to instruct his Japanese course Tuesday afternoon. Kanji is the Director of Photographic Services of Towson University." I should have run far, far away and never came back. Now that I think about it, I should have: Sprinted to my car. Driven 300 miles. Got on a plane. Taken a train to the docks. Hopped on a boat and never came back. Yeah, that's what I should have done when I had that Nikon D3 in my possession. Jokes aside, recently I've been toying around the idea of possibly trying to afford a Nikon D3, that is after I possibly sell my immaculate condition D2Xs. Since getting the D2Xs, I haven't really been totally happy with it in comparison to my much adored D300. But that's only my subjected opinion. In all honesty, the D2Xs been more or a less a lens holder when on assignment. Don't get me wrong I love the D2 series, but it's becoming apparent that it's better off as a studio or portrait camera rather than a go-to or second body when on assignment. When I owned a D200 I couldn't compare it to a D2Xs, but I liked those files much better than the D2Xs. Now that I have the D300, it's always my go-to camera for any situation. Dark situations are pointless with the D2 series. Caveat: It just struck me that anyone reading that is not a photographer probably has no idea what's being talked about. What are all these numbers? They are meaningless to you. I apoliogize. Feel free to leave me a nasty heart-filled comment on how I can make it up to you. Maybe I can take you out for pizza and a CD? Moving forward, I've been thinking of getting another D300, but the D3 has crossed my mind time and time again. Kanji bought one when they were first released, and I briefly used (read: shot one 11 frame burst) when he first got it. On Tuesday, I decided to swing over to his office to play around with it again for a longer period of time. What I liked was what I liked in my D300. A bright viewfinder, an enormous LCD screen, fast focusing and beautiful, workable files to name a few. In addition to some same features, it's a very solid camera with extra options. It's almost like a D300 with the finishing touches. Yeah. The whipped cream, sprinkles, chopped nuts, chocolate sauce, and, of course, a cherry on top. Oh, and did I mentioned the great ISO range on this monster camera? It's better than the D300. Yep. 6400 and that's not the cap. The D2Xs is pretty limited at 800 and sometimes I feel like that is pushing its limits, especially without a correct exposure. As for the D300, I feel it's pretty limited at 3200. At this point I could continue to give a vivid critique of the camera, but those still reading this post at this point probably know more than I do. And for those still confused, eyes drooping...Wake up! Pay attention! There is a quiz at the end of this post. This camera is near perfect though. I am so tempted to buy one after comparing it directly to my D300 and D2Xs. It truly is an amazing camera. The best part of the D3 is the full-frame. The worst part of the D3 is the full-frame. Every Nikon camera I've ever owned has had a 1.5x lens magnification factor. Thus meaning, my long lens, a 300mm, is really a 450mm. But since the D3 is full-frame, my 300mm, is well, a 300mm. So in reality, I am going to be losing some reach. My only conclusion is that if I do go for it, my teleconverter may be getting used a lot more or my D300 will most likely will host my 70-200mm and 300mm, unless desired otherwise. The upside is there is a crop mode, which I believe you can activate much like the high speed crop in on the D2 series cameras. But it does change the file size significantly. So my final saying, the final factor, the thing holding me back is that I am not as worried about my wide end of shooting as I am the long end of shooting. Currently, I am waiting to hear back from NPS, possibly get one to test out some more. I already have a couple interested in my D2Xs, so that sort of makes my possible purchase a little easier on my savings. Who knows though, I may just keep the D2, maybe get another D300 or go for it. If anyone already shooting with a D3 (I know there are a couple readers out there with a D3) I would love to get you feedback on the camera during daily assignments. Oh yeah, side note. Pick up my phone when in class. I missed a great opportunity by sitting in class and not answering my phone. Thanks again, Pouya. And Thanks again for letting test drive your D3, Kanji. How did you know I'd actually bring it back? hahaha. "Crowd member’s attention is diverted as a girl is tossed around the crowd during The Roots performance at Tigerfest at Towson University, Saturday, April 27. The Roots performed at the end of Tigerfest. The band played an hour-and-a-half-long set, which they finished up with their song “The Seed 2.0.”"
I engulf myself in photojournalism; it's not just a job, but a way of life. I always have a camera on me; I am always viewing others work. I live, eat and sleep it. After shooting an event and moving images on deadline I always need to look at my take again before bed. While I’ll often shoot two, three, four assignments a day, after I get home I have to go through my assignments at least once more. Editing more images that I find tell a story, whether or not it's interrelated to the assignment or are just visually graphic. Last night, after eating dinner I came home to continue writing my final paper of the semester, a 10 pager on a unique critical methodology I found within a movie of my choice. Being a huge fan of the Coen Brothers, this paper and others I wrote revolved around "Fargo" the entire semester. Since we had to come up with our own critical analysis using one methodology, this assignment not only got me viewing movies differently than I had before, but my photos a little differently, too. The above image is one I found a day after shooting Tiger Fest; the annual spring concert at Towson University. This image was not moved, although it was fitting of the concert… any concert. Anyone whom was in the crowd of fans could attest to its truth. Crowd surfing isn't anything new. For those unaware, people are hoisted up onto the crowd and carried along the soup of people with help of others hands. Before submerging myself into the wrath of the crowd, I was sure to get something off beat. I got pushed around, smoothed by sweating loud attendees and often had to watch for falling bodies when those around me decided not to hold up crowd surfers anymore, but it was worth it. Having never actually paid to get into a concert, I found it odd that males usually surfed for a couple seconds before being dropped to the ground. Conversely, women would be held up for a longer period of time, and everyone wanted to help push them along. I debated putting this image up, but after another look, it tells the creepy side of humans during concerts. This was a hail mail image, as I was crunched between bunches of screaming (some drunk) fans. But I saw the hands coming in from every angle as people tried pulling the girls clothes off and forced to lay a finger on her. Although this is a dirty image (no pun intended), one can see the sea of hands, pulling up her skirt, pulling down her shirt and groping her. But what I like is not the rough, blurriness that fits the scene, the depth of her feet and others hands, the truth of the moment, but how and all eyes laid on her instead of the concert. More concentrated the one audience member who fits perfectly, uncovered in the center of the frame. This is one of many images just from this single assignment that I never moved. It is one reason why I love this profession. Seeking the truth and the ability to capture it. In addition, the chance to go back look for different moments at later points in time. As for any woman that crowd surfs, including this girl, they have to know they will be groped when deciding to crowd surf. 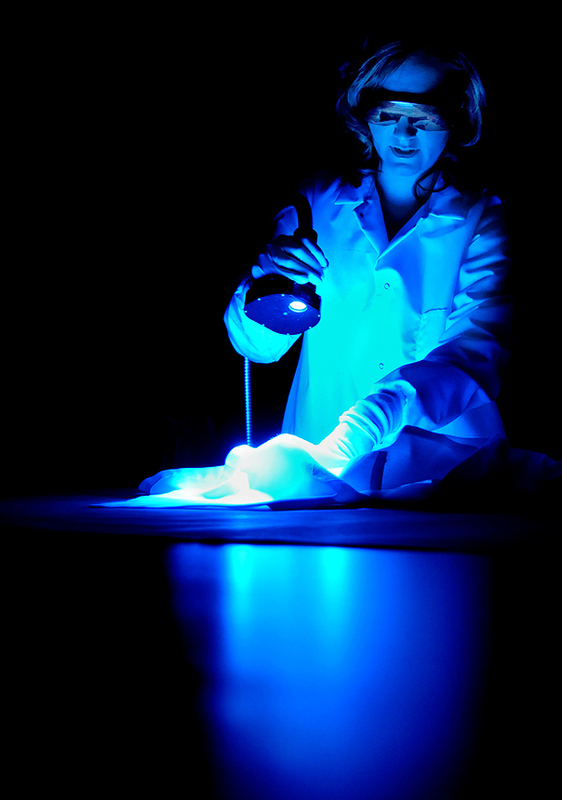 "Jennifer D. Bresett examines a piece of evidence from a cold case by performing an acid phosphatase light test in the crime lab at the Baltimore City Police Department Administration Building Wednesday morning. A serologist, Bresett is among the first that will graduate from Towson University with a masters degree in Forensic Science in May." Why is it every time I go downtown to Baltimore parking is horrendous? At least I am getting better at scoping out parking spots in the city and I am one helluva parallel parker now. I couldn't have said the same when I was 16-years-old (watches the cone and flag begin to tip over during driving test...Hey, I still passed). Anyways, Tuesday was my birthday, so I had the day off. I had one class at 3:30 p.m. but let my professor know I wasn't going there for other reasons (hey, I know you're reading Prof). My birthday was relaxing. I stayed at home most of the day and then went to dinner. Of course I had sushi, even though I regret eating it in America each time week I bite into the savory raw fish. I miss Japan. As for gifts, only the paper money and a kayak. I am pretty outdoorsy and thought it would be cool to get a kayak for the reservoir and ocean. To my surprise I got one. I am amped to try it out. In contrast, I decided to buy myself a lazy, indoor type gift: Playstation 3. Why? So I could be among the 40 million, or some ridiculous number, to buy the new Grand Theft Auto game. I am not much of a gamer, never really was, but this system is pretty entertaining and plays Blue-Ray DVDs. Now I just need to find time between shooting, class, my social life, and blogging to play. Heh. My birthday ended in 24 hours, shocking right? And I went back to my daily grind Wednesday morning starting with a portrait at the Baltimore City Police Department Administration Building. After struggling to find parking, I made it there only two minutes late. But for photojournalists, late always seems to be early and early always seems to be late. Go figure. The story revolved around Jennifer Bresett, a serologist, and one of the first that will graduate from Towson University with a masters degree in Forensic Science in May. I think the assignment was calling for a set portrait, but I opted to hangout for an hour and document her go through her day-to-day routine. It was fascinating to see what she and others in the crime lab did to each case's evidence. I also got a treat ending my assignment. A tour of the entire department. Mark Profili is a family friend, director of Forensic Chemistry/Science Programs at Towson University and director of the Baltimore Police Department’s Trace Evidence Analysis Unit. Before leaving, he introduced me to everyone and showed me around with Bresett. Half of the things the employee did confused me and all of the equipment and machinery puzzled me even more. But it must be rewarding to do what they do, especially in dangerous Baltimore. Just a small perk of the job sometimes to see deeper inside an operation. Thanks again, Mr. Mark. However, as I told Bresett, too much science for me. I'll stick to taking pictures. When I left, I saw an awesome feature of two men repelled on a building roof washing it. I think it was part of the aquarium, but not sure. I tried to find parking, but failed to. So I never got to shoot it. For the story, the above ran as the lead and this image (to be updated) ran with the jump.